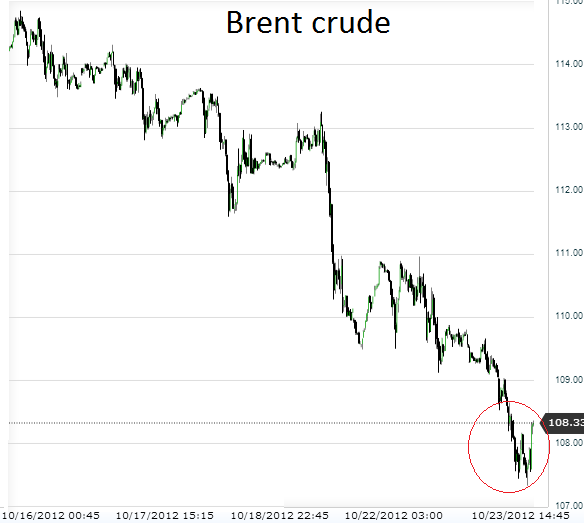 Crude oil prices have been on a steady decline in the past couple of weeks as global demand remains weak. These declines are pressuring Iran, who is already selling oil below market prices. That's why it was no surprise today when Iran tried to prop up prices by threatening to cut off oil sales altogether. Reuters: - Iran said on Tuesday it would stop oil exports if pressure from Western sanctions got any tighter and that it had a "Plan B" contingency strategy to survive without oil revenues. "We have prepared a plan to run the country without any oil revenues," Qasemi said, adding, "So far to date we haven't had any serious problems, but if the sanctions were to be renewed we would go for 'Plan B'. Brent rallied on the announcement but not nearly enough to offset recent declines. Market participants don't believe Iran would cut off its only major source of funds to "punish" the West. This simply shows an increasing desperation of the government as it tries to cling to power. Internal rift within the government is escalating (see NYTimes story), and it looks increasingly likely that Ahmadinejad is on his way out. It is possible that he will be used as a scapegoat by his successor who will blame him for the nation's deteriorating economic conditions. Additional declines in oil prices combined with increased sanctions from the EU and the collapsing currency will further destabilize and already strained political situation in Iran.